You will enjoy this perfect escape in our totally updated coastal cottage. Nestled in the quiet, historic Morro Heights you can escape from the hustle bustle of city life. You’ll hear very little traffic or neighborhood noise because you are tucked away behind our main house in the secluded setting of Morro Heights. The drought tolerant yard offers ample seating for your early morning coffee, Happy Hour and an evening BBQ. Fresh herbs & veggies are planted near the walkways to add to your meals. Inside you’ll quickly see the fresh and totally updated home. It is so incredibly cute, clean and well-decorated in shabby-chic/coastal décor. Both bedrooms are comfortable and cozy. Master has a Queen bed and 2nd bedroom has a double. Huge closets in each to store clothes and gear. The comfy living room is inviting to kick back in, open up the windows and feel the breeze. There’s a nice shower/tub with great water pressure. We offer high speed internet, cable TV, plenty of books and games if you choose to stay in. The fully equipped new kitchen has granite counters and stainless appliances. You can pretty much take off on foot anytime day or evenings from 'The Cottage'. We are on the ‘water’ side of Hwy 1, so easy access to all. Groceries, library, downtown, Farmers Market, Top Dog Coffee are all just a few blocks. Get your retail therapy taken care of too! Daytime, enjoy surfing, boogie boarding or surfing North of the Rock, taking Paddle Board lessons in the bay, watching marine life and don’t miss the otters! When you’re finished head up to our favorite spot, Dockside Too, on the fishing docks for all types of fish, wine or beer and live music every day. Evenings, stroll 7 blocks to the Embarcadero for Happy Hour fish tacos at Dutchman's, or take a dinner cruise. Visit the natural bird sanctuary, the natural history museum and Morro Bay Natural estuary and go birding. Take a stroll; hike Black Hill, Morro Dunes trails or Montana de Oro. Check out the new pedestrian bike bridge that will take you to the North end of Morro Bay or head on out to Morro Rock for a great morning walk. We offer plenty of space for your bikes, surfboards and gear plus a hot outdoor shower to rinse off the sand. When it’s time to turn in, leave your windows open and listen to the surf and foghorns – can’t beat that! Regardless if you are either a military history buff or a 60's and 70's Rock and Roller you will enjoy the rich history of this quaint 800 sq ft Cottage. Morro Bay was once the site of naval training, in part for the D-Day invasion. Imagine the conversations between officers as they readied for battle in this historical WW II officers' barracks that was later converted to a home for one of Morro Bay's oldest business couples and their family. Now fast forward to the mid 60's. Two sons raised in this cottage were very active in the Rock and roll scene. Members of Spanky and Our Gang, the Turtles, the Byrds, and more spent time here as they gigged their way between Los Angeles and San Francisco. If the walls could sing you would hear them swapping songs and working on future hits. We have recently retired from San Diego and just completed building our new home in Morro Bay. The Cottage sits behind our home and is secluded from the street. We love having visitors stay and give them complete privacy. We love to hike, kayak, bike, and watch sunsets from our deck. Rich plays guitar and sings 60's and 70's rock at many local wine bars. Master bathroom has tub/shower combo. Lots of hooks for your towels, robe, jeans & make-up bag. Walk 7 blocks through downtown and be at the edge of Morro Bay, on the Embarcadero. Great full size oven. Cooked turkey in it last year. Full size microwave & vent over the stove. Salt & pepper plus basic spices, sweetener, coffee and filters, creamer, oil, and misc pantry items. Plenty of outside area to keep your bikes, surfboards, wetsuits & beachtowels. Everything was perfect for a weekend getaway. Beautiful garden out front! Friendly owners who were very kind in offering suggestions on where to go and what to see. Would definitely recommend to friends and family. Enjoyed staying at this well located cottage. We were able to walk to shops and restaurants on the waterfront. A major grocery store is a short walk away. Motto Bay is a very relaxing little town. This cottage, tucked into a quiet neighborhood was lovely. The house was well kept and maintained. Decorated in a cozy California style with many added touches. Lovely garden to sit in and walking distance to the bay and restaurants. Outdoor activities abound and are nearby. Dianne and Rich are warm and accommodating hosts with a wealth of information about the area. Highly recommend and will return to this delightful cottage. Our group of 3 enjoyed the cozy comforts of this cottage. The kitchen was well equipped and the cabinets were well stocked. Beds were comfortable and lots of warm linens. We were so close to downtown and various meeting areas for the birding festival that we rarely had to drive. Thanks for making our stay enjoyable! We thoroughly enjoyed our stay at The Cottage! It is the perfect distance from all the amenities you need (shops, Embarcadero, etc.) but far enough away from the hustle and bustle of the tourist areas. The bedrooms and living room were comfy and felt like we never left home. Dianne and Rich are wonderful people and were a great help to us while we were there. And BTW, don't forget to pick up one of Rich's CDs and/or see one of his shows while you are there. In addition to being a landlord, he's also a talented singer/songwriter. 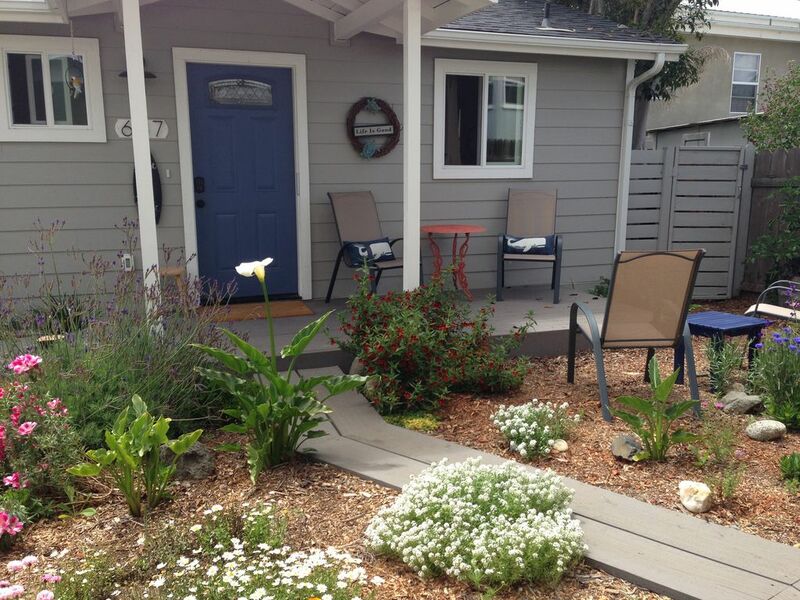 We are looking forward to staying at The Cottage again when we make our next trip to Morro Bay. Thank you so much! It was our pleasure to have you stay at The Cottage. Please do come back again. What a gem. This place was THE PERFECT location and environment. Quiet location and just absolutely beautiful. This home is close to everything and you can walk to many places. The family who owns this property is very warm, kind and helpful. Wish I could spend forever here. Thank you so much! We were so glad to have you stay at The Cottage and that it worked out so well for your special time here. Hope to have you again sometime. Paddleboard rentals & instruction, kayak rentals, whale watching tours. New Years weekend, Easter weekend, Memorial Day weekend, 4th of July weekend, Labor Day weekend, Thanksgiving weekend, and Christmas weekend are a 3 night minimum stay. No TOT taxes collected for stays longer than 30 days.